before returning the passport to me, and saying I wouldn't be able to come back to the UK again. They did not confiscate anything from me. 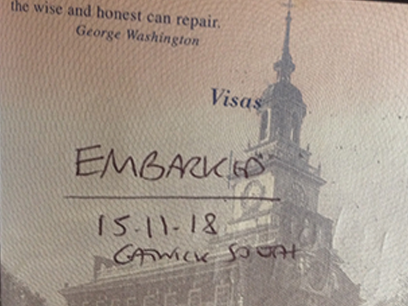 I did not overstay my UK visa, and I have traveled on to another country for the last 6 months, but I do have a return ticket to the UK, but I'm concerned that this mark in my passport is because I have been given a black mark and I will not be granted a visa. I understand that there are normally no exit stamps on leaving the UK. I'd appreciate to hear if anyone knows what this mark in the passport means. Also, if I do have a black mark against my passport, would that be something visibly written in my passport, or something only UK immigration would know about? I would assume it would be the former, but I really don't know. This is quite an unusual notation and according to immigration protocol, with any kind of ban you should have been provided with the appropriate paperwork. From your narration, this was not the case. Either that or you did not understand what the immigration officer said concerning the supposed ban. Furthermore the immigration rules and guidance for bans does not mention a permanent ban in your context namely i.e. illegal work or breaching a condition attached to their leave. You can complain or ask for clarification using the email complaints@homeoffice.gsi.gov.uk which can be found on the UK Visas and Immigration Complaints Procedure webpage. They will clarify if the officer banned you (because it will be in their records) or went contrary to protocol etc. They take complaints seriously. I lodged a complaint with UK Border Force and it was handled very professionally and promptly and in my favor. Not the answer you're looking for? Browse other questions tagged visas air-travel uk customs-and-immigration or ask your own question. Can an Australia visa rejection blackmark me forever? How does UK Border Force decide which travelers get extra scrutiny?